This chapter traces the development of the relations between the European Union (EU) and Taiwan, or the Republic of China (ROC), marked by the switch of the recognition of all EU member states to the People’s Republic of China (PRC) and the consequent one-China policy. The one-China policy denies third countries the right to give statehood recognition to the ROC once they have recognized the PRC. 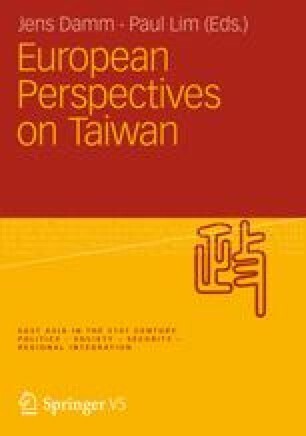 As a de-recognized entity, Taiwan has difficulty in enjoying relations – albeit informal – with the rest of the world, but informal relations between the European Union and Taiwan have now recovered from a low in the 1970s and are at an unprecedentedly high level. DG Trade, European Commission (2008) Taiwan: EU Bilateral Trade and Trade with the World, 10 September. Online. Available HTTP: <http://trade.ec.europa.eu/doclib/html/113452.htm> (last accessed 20 June 2009). EarthTimes (2009) “World Health Organization to Deal Directly with Taiwan”, 22 January. Online. Available HTTP: <http://www.earthtimes.org/articles/show/251872,world-health-organization-to-deal-directly-with-taiwan.html> (last accessed 1 April 2009). EU AT (2006) Plassnik: 'A Broad Array of Topics Connects China and the EU', 3 February. Online. Available HTTP: <www.eu2006.at/en/News/Press_Releases/February/0302TroikaChina.html> (last accessed 31 March 2009). European Economic and Trade Office (2008) EU-Taiwan Trade and Investment Factfile 2008.Online. Available HTTP: <http://www.teltwn.ec.europa.eu/upload/rte/eeto-052808-factfile%20-%20webfile.pdf.pdf> (last accessed 20 June 2009). European Union (1998) “European Union and Taiwan Conclude Bilateral Market Access Negotiations,” IP/98/629. RAPID Press Release, 23 July. Online. Available HTTP: <http://europa.eu/rapid/pressReleasesAction.do?reference=IP/98/692&format=HTML&aged=1&language=EN&guiLanguage=en> (last accessed 26 March 2009). European Union (2001) “Commission Approves the Terms of Accession of China and Taiwan to the WTO,” IP/01/1289. RAPID Press Releases, 19 September. Online. Available HTTP: <http://europa.eu/rapid/pressReleasesAction.do?reference=IP/01/1289&format=HTML&aged=0&language=EN&guiLanguage=en> (last accessed 26 March 2009). European Union (2003) “European Commission Establishes European Economic and Trade Office in Taiwan,” IP/03/347. RAPID Press Releases, 10 March. Online. Available HTTP: <http://europa.eu/rapid/pressReleasesAction.do?reference=IP/03/347&format=HTML&aged=1&language=EN&guiLanguage=en> (last accessed 26 March 2009). Eurostat (2009) External and Intra-European Trade: Statistical Yearbook - Data 1958–2007. Online. Available HTTP: <http://epp.eurostat.ec.europa.eu/portal/page/portal/product_details/publication?p_product_code=KS-GI-08-001> (last accessed 20 June 2009). Free China Journal (1988) “EEC Tariffs Hurt ROC Most”, 27 October. Online. Available HTTP: <http://taiwanjournal.nat.gov.tw/site/tj/ct.asp?xItem=4740&CtNode=118> (last accessed 25 September 2008). Ministry of Foreign Affairs, Republic of China (Taiwan) (2008) Proposal of Participating Meaningfully in the Activities of the UN Specialized Agencies: United Nations General Assembly, A/63/194. Online. Available HTTP: <http://www.mofa.gov.tw/webapp/ct.asp?xItem=33781&ctNode=1028&mp=6> (last accessed 1 April 2009). Mo, Hong’e (2009) “Mainland, Taiwan to Hold Talks in Late April or Early May.” XinhuaNet, 15 April. Online. Available HTTP: <http://news.xinhuanet.com/english/2009-04/15/content_11189374.htm> 2009-04/15/content_11189 374.htm> (last accessed 15 April 2009). Taiwan Security Research (1999) “President Lee's Deutsche Welle Interview”, 9 July. Online. Available HTTP: <http://taiwansecurity.org/TS/SS-990709-Deutsche-Welle-Interview.htm> (last accessed 1 April 2009). The China Post (2009) “Success in Nanjing”, 27 April. Online. Available HTTP: <http://www.chinapost.com.tw/taiwan/china-taiwan-relations/2009/04/27/205766/Success-in.htm> (last accessed 28 May 2009).